Ordinary headaches are part of the normal human experience. Most of the time, it's just a headache, perhaps severe and disabling, but typically not dangerous. However, a headache that is severe, persistent or associated with other symptoms such as vomiting and confusion is a warning signal to a dangerous problem. 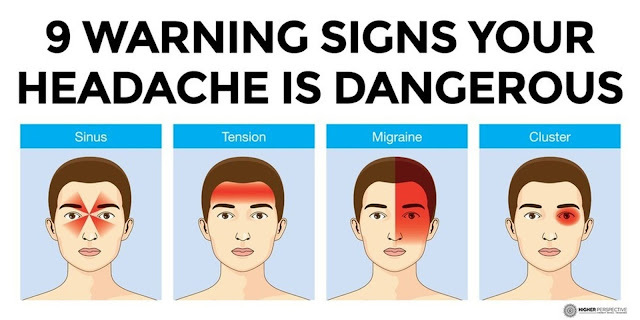 In fact, a headache can be an early warning sign of more complicated and serious health issues such as stroke, infection, or high blood pressure. If you may experience either one of these symptoms, visit your doctor immediately. You could have a ruptured aneurysm in the brain which will cause headache pain and upper neck pain when you are lying still. Vomiting, confusion, stiff neck, and light intolerance are more red flags to look out for. If you have a frequent and fairly severe headache which develops quickly, in one minute, then this could be a sign of thunderclap headaches which can be the result of post stroke brain bleeding, head injuries or aneurysm. This could be a symptom of a brain tumor. If when you go to bed with a headache then wake up and it is worse, even causing vomiting, then this is a red flag. If the headache increases with exercising or walking, this is another serious red flag. If after you have a head injury, you feel a headache developing, you should seek medical attention. This could be a sign of a concussion. Even if it is a small injury to the head, bleeding of the brain could be occurring which would be the cause of the headache you are experiencing. Experiencing a sudden headache may also include experiencing numbness and pain on one side of the body. Your arms, legs and face muscles may feel weak. You may have difficulty speaking, balancing, walking, and seeing. This could mean you are experiencing a heart attack. If you have an unusual or weird headache which just feels “off” for some reason, then definitely consult a doctor.